Thank you to all who cast their votes either online or visited the Stingray Music Booth at the Waterfront Stage! (July 16, 2018 – HALIFAX) The TD Halifax Jazz Festival is proud to partner with leading, international digital music provider, Stingray Music, to announce the winner of the 2018 Stingray Rising Stars contest, Quebec’s Emie R Roussel Trio. The Stingray Rising Stars program offers awards and showcase opportunities to emerging Canadian artists. 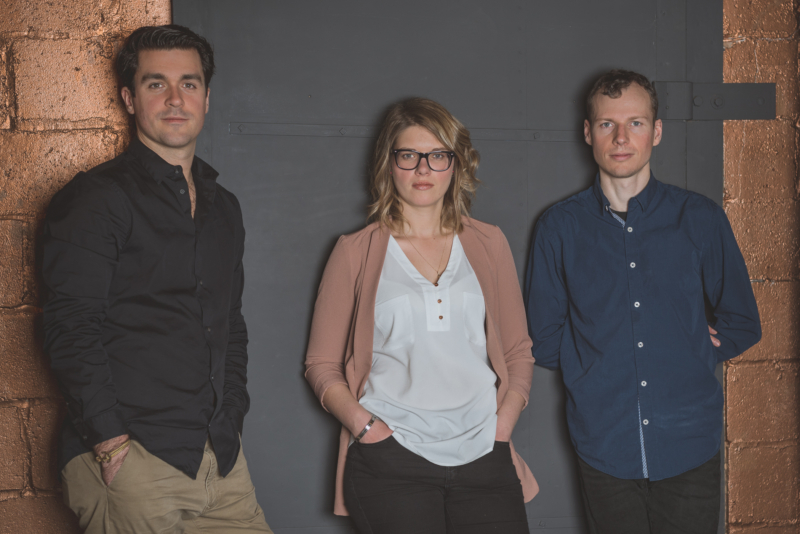 The Emie R Roussel Trio won the 2015 Félix for Jazz Album of the Year for their 3rd album, Quantum, and the 2013‑14 Opus prize for Jazz Album of the Year for their preceding release, TRANSIT. The trio has experienced a dizzying ascent since 2010, and is now an unstoppable force in the Canadian jazz scene. With Emie R Roussel on piano (Révélation Radio-Canada Jazz 2014-2015), Nicolas Bédard on bass, and Dominic Cloutier on drums, the trio delivers creative and captivating jazz with passion and undeniable chemistry. The trio is no stranger to accolades for its music from both industry and music fans having garnered Special Mention from the jury of the TD Grand Jazz Award at the 34th Montreal Jazz Fest, and winning the Audience Choice Award at the 2013 Festi Jazz International de Rimouski. The group has not only been doing more and more concerts in Canada but has begun making its mark around the world, winning admiration in eleven countries and on four continents. During a 2014 tour of Australia and New Zealand, they performed at the Melbourne Women’s International Jazz Festival and in the cities of Sydney, Brisbane, Auckland and Wellington. Emie R Roussel Trio was chosen through a two-tiered process of peer assessment and online voting and will receive $3,000 to advance her career. Online voting took place at halifaxjazzfestival.ca/vote/ and at the Stingray Music booth at the Waterfront Stage during the TD Halifax Jazz Festival, July 10-15. The winner was announced, Sunday, July 15, from the Waterfront Stage. Thank you to all who cast their votes either online or visited the Stingray Music booth at the Waterfront Stage! Launched in 1998 as Galaxie Rising Star, the Stingray Rising Stars program seeks to discover, encourage, promote, and champion new and up-and-coming Canadian artists. The Stingray Rising Stars program is presented at a variety of music festivals and conferences across Canada each year. Stingray Music’s team of 150 expert music programmers curates over 2,000 commercial-free music channels in 100 genres available on TV, web, and mobile distributed within Canada and internationally. Support for the TD Halifax Jazz Festival is provided by numerous corporate and community partners including TD Bank Group, Waterfront Development Corporation, Stingray Music and funded by the Government of Canada, Province of Nova Scotia, Halifax, and the Craig Foundation. Atlantic Canada’s oldest and largest music festival, Halifax Jazz Festival has presented a diverse range of musical and educational activities since 1987, including the 32nd annual TD Halifax Jazz Festival. For more information visit halifaxjazzfestival.ca, “follow” Halifax Jazz Festival on instagram or twitter @HFXJazzFest or “like” on facebook.